Stainless steel is light and contemporary and coordinates with many decors. Do enough research into the subject of stainless steel in the kitchen—stainless appliances, stainless sinks, stainless countertops—and you'll learn that stainless steel is timelessly stylish, easy to maintain, scratch resistant and economical. You'll also learn the opposite—that it's a fad, adds unnecessary expense to a kitchen, scratches and dents easily, and requires constant cleaning and polishing. Each of these conclusions is true in its own way and the conclusion, which hinges on your personal values and tolerances, is something you have to determine for yourself. Stainless steel is a durable, rust-resistant, stain-resistant alloy of low-carbon steel, nickel and chromium, sometimes with other metals in lesser amounts. The chromium, which makes up 12 percent or more of the alloy, is what gives stainless steel its corrosion resistance. The chromium reacts with oxygen in the air to form a thin, invisible coating of chromium oxide on the surface of the metal. That coating protects the iron in the steel from rust. If the chromium oxide layer is scuffed or scratched away, it quickly heals itself with new oxide. Stainless steel is produced with a variety of finishes—mirror, brushed, satin, and also some specialized textures. The most common finish for appliances and countertops is a brushed finish with a visible "grain" that serves somewhat to camouflage scratches. Stainless steel sinks are typically given a satin finish. The thickness of the stainless steel is expressed in terms of gauge—the lower the gauge number, the thicker and more dent-resistant the steel. Countertops are produced using 12- to18- gauge steel, the 12 gauge utilized primarily in heavy-duty commercial applications and 16 gauge considered appropriate for residential use. The gauge of stainless steel used in sinks runs from 16 gauge for the heaviest and most expensive to 22 gauge for the lightest-duty sinks. To maximize the life of your investment, it's well worthwhile to select the heaviest gauge option you can afford. Stainless steel sinks can be integrated into the stainless countertop. There are solid reasons why commercial kitchens choose stainless steel for their countertops and equipment. 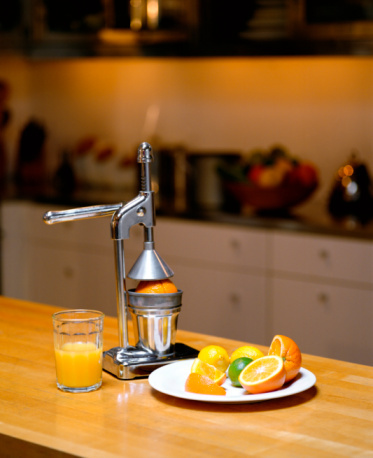 Stainless steel is non-porous and easy to clean and sanitize. It won't stain, absorb oils or react to acidic foods. Hot pans won't damage it. When stainless steel is used in a residential setting, however, some of the downsides of the material become more of a concern. One of the biggest potential drawbacks is that stainless steel is subject to scratches and fingerprints. In a commercial kitchen, scratches on the countertops would be a non-factor but in your home, they can be aggravating. 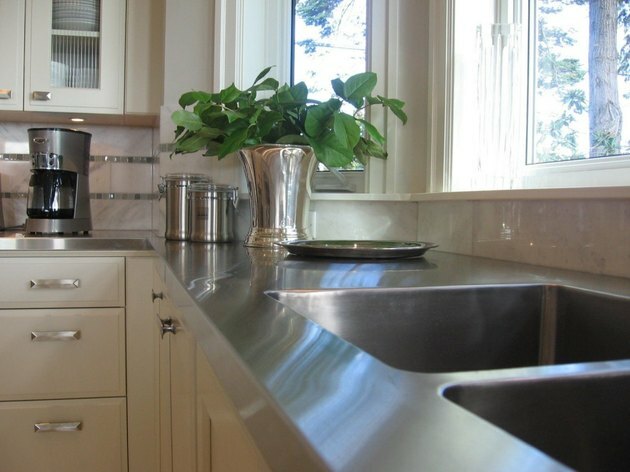 Stainless steel countertops are generally custom crafted to perfectly fit your kitchen. The shiny steel, while cold-appearing in itself, will pick up and reflect the colors in your kitchen, thus complementing the decor. To fabricate the countertops, stainless steel is wrapped around a pre-fitted wood core. This core adds strength and support to the steel and also helps mute the noisiness the metal surface would otherwise produce. Even with the wooden core, stainless steel countertops will be noisier than laminate or solid surface countertops. The standard edge treatment for stainless steel countertops is a basic square, but custom bullnose or beveled edges are also possible. The pros and cons of stainless steel kitchen appliances echo those of stainless steel countertops. They are easy to keep germ free but difficult to keep free of scratches and fingerprints. Their reflective quality lets them assume the coloration of the rest of the kitchen. For those who prize the look of stainless steel, its presence represents a substantial kitchen upgrade. Stainless steel-fronted appliances tend to be significantly more expensive than appliances with other finishes, yet the stainless is only skin deep, so to speak. It contributes nothing to the mechanical performance or reliability of the appliance. 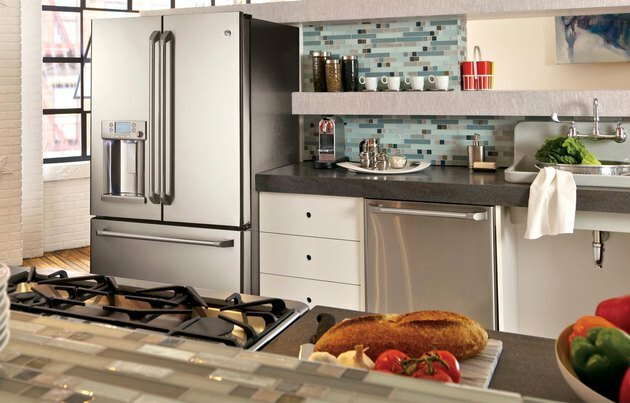 Stainless is also non-magnetic, so your refrigerator magnets will have to find a home elsewhere. The choice of stainless steel sink styles is nearly limitless. Stainless steel sinks are available in a nearly limitless variety of styles, shapes and sizes. They are manufactured in one of two ways: folded or stamped. Folded steel sinks are cut from a sheet of stainless, then bent and joined at the corners. These are generally considered the premium sink because the metal maintains a uniform thickness throughout. Stamped sinks are formed by heating the metal and shaping it over a mold. This process can stretch the stainless steel thin in places, creating a less uniform product. As with the countertops, stainless steel sinks can be noisier than porcelain or solid surface models. 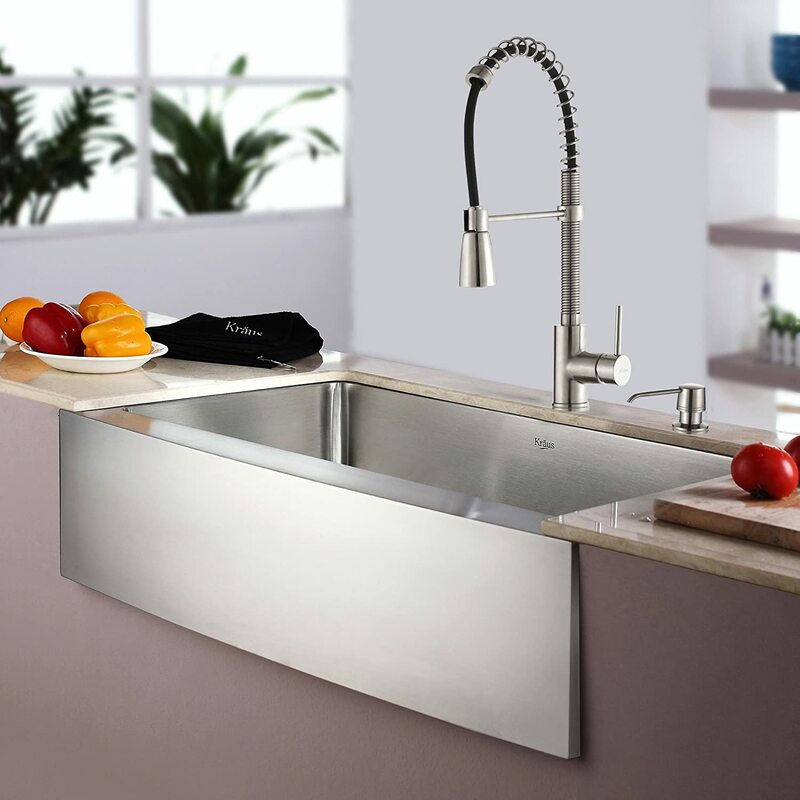 To minimize the noise, higher-quality stainless steel sinks are given a sound-deadening coating to the underside. Stainless steel is an excellent, durable, functional, attractive material and the decision to employ it in your kitchen is ultimately one of personal taste. Keep in mind not only how it looks when new but also how it will look as it ages, perhaps with a patina of scratches. You're likely to be living with it for a long time.